You think that your bike's performance features could be enhanced with components selected á la carte at your local bike shop — and that you should be able to accomplish this despite the spawn of deviant bottom bracket "standards" that have created component compatibility issues. Conventional threaded bottom brackets like your English-threaded BB shell shouldn't foil plans to upgrade your ride. 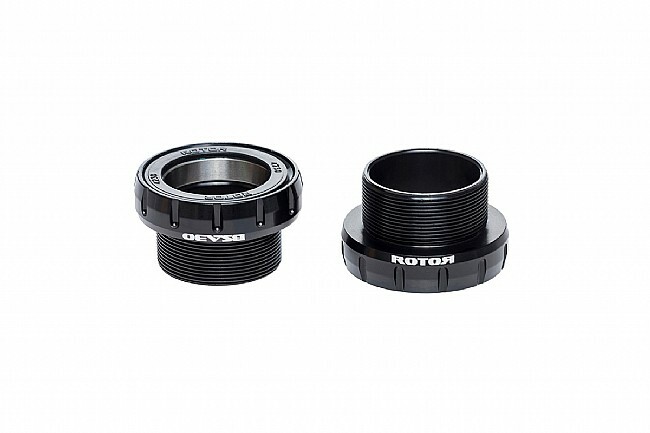 ROTOR conceived its Universal Bottom Bracket (UBB) concept to eliminate the complicated bottom bracket/crank compatibility challenge that has increasingly frustrated the mechanics at your LBS. The BSA 30 is the "yes" component to "Is this compatible with my English-threaded BB shell for a 30mm axle? Designed to work with BSA threaded bottom brackets and 30mm axle ROTOR cranksets.